Join us at The Petersfield every Friday and Saturday between 2pm-5pm for afternoon tea! * £14.50 per person - you can upgrade to royal afternoon tea for £10pp which includes bubbles and delicious add ons to make prosecco cocktails. Afternoon tea includes finger sandwiches, blinis, scones & sweet treats. *Minimum of 2 people required. Mondays are all about wine & cheese at The Petersfield! Day 5 – Christmas Quiz! Test your knowledge in our Sunday night quiz! 7:30-10:00pm £1 Entry on the night Book a table to avoid disappointment! <a class="menucta" href="Book Your Table! #bookatable">Book Your Table! Day 1 – Partridge in a Pear Tree! Our Partridge in a Pear tree will bring a special menu and a unique cocktail for the first of many exciting Christmas events! <a class="menucta" href="Book Your Table! #bookatable">Book Your Table! Day 2 – Fancy a Night Cap? Come and try our new Night Cap Menu! Special hot drinks, new cocktails and sharing boards all served from 10:30pm-12:00pm Thursday to Saturday! Why not come and try it all out on the launch night! And with flights of whisky just £10, what more could you want to get you through those cold winter nights?! <a class="menucta" href="Book Your Table! #bookatable">Book Your Table! Day 3 – World Christmas Jumper Day! Get your jumpers out! It's World Christmas Jumper Day and to celebrate we will be giving a free drink to anyone wearing one. There will also be a prize for the best one! So bring out your cheesiest knit and may the best dressed win! <a class="menucta" href="Book Your Table! #bookatable">Book Your Table! Day 4 – Gingerbread House Competition! Fancy a bit of light-hearted decorative fun? Come and have a go in our Gingerbread House Decorating Competition! You don't need to be skilled in the art of icing, just willing to give it a go, and who knows, you could be our winner! FREE EPIC HOT CHOCOLATE FOR ALL PARTICIPANTS! <a class="menucta" href="Book Your Table! #bookatable">Book Your Table! Day 6 – Special Wine & Cheese Night! Day 7 – Festive Murder Mystery! Day 9 – Festive Moos and Brews! Day 10 – Christmas Disco! Day 11 – Champagne Brunch! We at The Petersfield wanted to give a little thank you to all our fabulous regulars and locals for your support. Join us for a glass of champagne & festive canapes as we cheers to Christmas. Starting from 6pm - Invitation only Book Your Table! ** You're invited to our second birthday party** We can't believe how fast the last two years have flown by, we want to say thanks to all of our wonderful, amazing customers for helping to make the pub what it is today!! We will be serving up birthday cake all day to our lovely punters and of course Bruno will be here to join in on the celebrations too! We look forward to seeing you! Book Your Table! B U R N S N I G H T Join us at The Petersfield for a delicious 3 course set menu for burns night from 5pm until 10pm. Smoked haddock chowder sour dough Haggis Root veg mash, braised red cabbage, roast apple & whiskey sauce Cranachan Whiskey cream, oats & cherry sorbet £19.95 for 3 courses. We also have some super yummy whiskeys if thats your tipple? Look forward to seeing you soon!! Book Your Table! S I X N A T I O N S Join us at The Petersfield for every six nations games from 1st Feb through to 16th March . We will have plenty of our delicious bar snacks available and, of course, scrummy beers. **Make sure you pick up one of our Petersfield 6 nations cards - the more games you come to, the better the prize** Book Your Table! The Wassanames at the Petersfield! P I E W E E K From the 4th - 10th March it's national pie week. Make sure you come down to the pub for our daily special £10 pie and mash of the day. We will have a different pie each day so there will be something for everyone! Delicious!! Book Your Table! ** MOTHERS DAY** Treat your mum this mothering Sunday! we serve brunch from 10am - midday and then our fabulous roasts are served all day from 12-9. Why not bring the whole family down and join in our Sunday night quiz from 7:30pm?! Call the pub on 01223 306306 to book in NOW!! Every Thursday you can enjoy our Moo & Brew night - a burger and beer for just £10 !! Book Your Table! 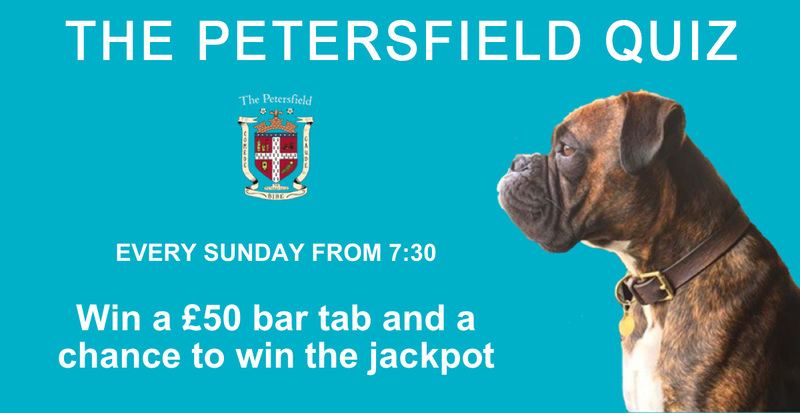 Sundays are BIG at The Petersfield..we don't do things by halves..first up you can enjoy an amazing brunch at your leisure, followed by one of our incredible roasts, and then finally we round off the week with our really fun pub quiz, starting at 7.30pm - Win a £50 bar tab and a chance to win the jackpot...see you next Sunday!﻿ Don't forget to book! Every Monday head down and try a great selection of cheese & wine! Book Your Table!